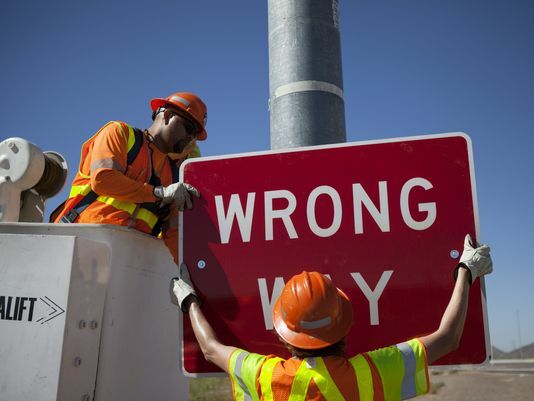 Arizona transportation officials erected new signage at various highway exit ramps throughout the state on Wednesday hoping the efforts will curb the recently-escalated problem of wrong-way driving, but it remains clear the problem does not have an easy fix. Five incidents involving wrong-way drivers occurred in the Valley within the past six weeks, killing seven people and injuring an additional 11, according to the Arizona Department of Public Safety. The Arizona Department of Transportation introduced new signs at the exit ramps in the Phoenix-metro area that are bigger than current signs and placed lower to the ground. An additional “wrong way” sign was placed below the now-larger “do not enter” sign. Further down the exit ramp toward the highway, ADOT has painted two large arrows equipped with light reflectors signaling the correct direction of travel, according to ADOT. The new efforts were placed at six exit ramps throughout the Valley in order for ADOT to determine if the safety measures are effective in deterring wrong-way drivers, according to Tim Tait, a spokesman for ADOT. Tait said the locations were picked because of histories of wrong-way driving activity provided by DPS. If ADOT determines the signage is effective in lowering incident numbers, the changes will be implemented at all 475 highway interchanges across the state, he said. ADOT, DPS and the Governor’s Office of Highway Safety met in order to determine what measures would be most effective to lower the numbers of wrong-way drivers after the recent spike. Even though Tait believes the changes will be effective, he said the sign changes are not the only solution, but just one way to inform drivers of when they are going the wrong way. The challenge of reducing the number of wrong-way drivers will largely depend on how effective changes are with impaired drivers. State investigators believe that three of the drivers involved in the recent string of wrong-way incidents were impaired, according to court records, and continue to investigate impairment as a factor in the two other incidents. Local law enforcement agencies and DPS patrols do not amount to enough to catch every impaired driver before they enter the highway, Garcia said. “We’re doing everything we can,” he said. Garcia said the problem is a “community problem.” The community needs to step up and take care of each other, stopping impaired individuals before they get behind the wheel of a vehicle, he said. Garcia warned that if community members do not prohibit impaired individuals from driving, the authorities will apprehend them and press charges.